Individuals with co-occurring substance use and mental health disorders have struggled in the past to find the right front door to enter into services. They often went to a mental health provider and were told that they needed to abstain from substance use before being treated for their mental health condition. Or they would attempt to enter services at a substance use disorders treatment center, only to be told that the facility could not treat their mental health issue and they would need to go elsewhere, or their symptoms would interfere too much for them to be successful in treatment. Fortunately, integrated co-occurring disorder treatment is becoming more common. 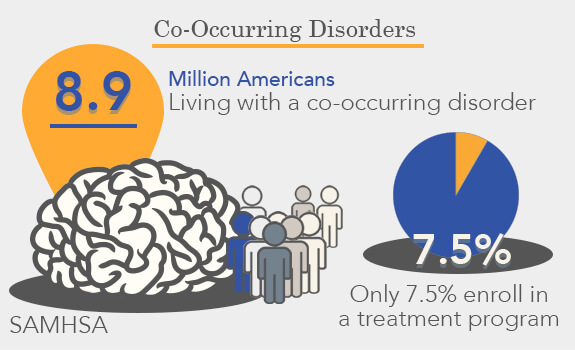 People with co-occurring disorders are best served through integrated treatment. With integrated treatment, practitioners can address mental and substance use disorders at the same time, often lowering costs and creating better outcomes. Comprehensive Healthcare is proud to be a leader in providing integrated co-occurring disorder treatment. Every door is the correct door to enter into services at Comprehensive. We specialize in saying “Yes” to individuals seeking treatment for both conditions, and provide integrated treatment programs which will address the person’s substance use disorder and mental health needs at the same time. Comprehensive strives to ensure that all our clinicians are knowledgeable on the integration of these two disciplines to improve the health and wellness of those that we serve. Please contact us at our various sites to ask about the integrated co-occurring disorder treatment services that are offered in your area.